Welcome to our round up of books published by or featuring Darlington groups, publishers and individuals. ‘No. 1’ was first published in 2014 and then after about two years it was withdrawn by the author Tony Stowers (Darlington-born) from sale for 18 months to have a massive facelift and restructuring (including a glowing review from Tony Fox of Durham Historical association as a Foreword). Thanks in large part to the editing skill of Sylvia Suddes of Foolproof.com and Julie Martin for the new cover, it is now back on the market and in the author’s view worth every penny re-invested into it. The book can be borrowed from Crown Street and Cockerton Libraries or bought at North Road Railway Museum but isn’t available in shops like Waterstone’s, though it should be. Perhaps next time you are in Waterstone’s you might mention it to them? Pam Bassington is a Parish Administrator, Artist and., She has worked in Nursery Education for over eighteen years and has had the pleasure of reading stacks of stories to countless children. In 2012, she gained a BA (Hons) First Class in Contemporary Fine Art. ‘What People Do’ is aimed primarily at pre- school children; the verses are simplistic yet educative, and Pam’s thirty individuals provide a quirky insight into a variety of occupations. Jolly little rhymes about endearing individuals and how they earn a living, she hopes it makes you smile. The second novel by Tracey Iceton has been published. Herself Alone in Orange Rain is part two in the Celtic Colours trilogy by the author, who is one of the organisers of Darlington Arts Festival. She didn’t look for the Troubles, but they found her nonetheless, and now, whatever the cost, she must join the cause to help rid the Six Counties of the British. The Icarus Project by Darlington thriller writer Roger Barnes has been published through Inscribe Media. During his Inauguration speech, newly elected American President Alan Maddox announces in it is his intention to initiate a project that will rid the world of toxic waste. A project visionary in concept to transport it into the Sun; disposing of it permanently, “The Icarus Project”. When one of the Canisters carrying radioactive and chemical wastes goes rogue and is drawn in to the gravitational field of nearby planets the die is cast for a catastrophe waiting to happen. By vagaries of the sling shot effect its velocity is accelerated dramatically, and now easily leaves our solar system. Its path through the immense emptiness of space is influenced only by space winds and the gravitational pull of planets or comets it passes. And so it travels at ever increasing speeds carrying it over time to; and beyond Galaxies mankind cannot even see let alone comprehend. Inevitably, it collides with a planet and its lethal cargo, which has fermented over aeons bursts killing the people that inhabit it. This Galaxy convenes a tribunal to try Planet Earth, as defendant it selects Syfax a Roman Gladiator from 129 AD, and by accident David Greenham from the present day. These two men must defend earth from the wrath and vengeance of a vastly superior race that has the ability to travel through time and space, and to who the destruction of a planet and its people is of little or no consequence. The Book Folks have published Bud Craig’s collection of award-winning short stories, High Profile. It is available to download onto your kindle now. The title story brings you the latest adventure of Salford private eye, Gus Keane. Others feature a time-travelling Will Shakespeare, an Elvis fan from Salford who goes to Memphis, Tennessee and gets all shook up and a cricket lover who dies without knowing the result of the 2005 Ashes series. Most stories have won, been shortlisted/commended in international competitions. Some are in the crime genre, the rest cover romance, sci-fi, surrealism and a combination of every genre you can imagine. The Prison, a new anthology of short stories by Darlington author Michael Jarvie, is on sale for reading on Kindle. Taking its inspiration from James Joyce’s notion of the “epiphany,” as exemplified by his pioneering work “Dubliners,” this collection of short stories – or composite novel – focuses on the theme of imprisonment. The second crime novel by Darlington author Michael Beck has been published. Making A Difference, which is available as an ebook published by Inscribe Media, is set in a fictional northern town and tells how Greg Preston, Mister Average in his mid-thirties with a wife and two children, becomes radicalised by an extreme left wing anti-capitalist movement. The book starts with the funeral of Greg’s younger brother Allan, who committed suicide in prison having been convicted of possession of a firearm that he was moving on behalf of the Movement. Allan had quit university in London, disillusioned by the inequality of life and had lost touch with his family who only discovered he was back in the area when he was arrested in a nearby town. The funeral is the starting point for Greg’s desire to find answers as to why his brother took the decisions he did and what ultimately drove him to suicide. Greg had already been identified as a potential recruit by the Movement and when they become aware of his quest they approach him and offer to give him some of his answers. He agrees and this is the start of a process of subtle manipulation by members of the movement who play on his feelings for his dead brother and, combined with other events, steadily draw him towards them. The novel ends in a dramatic climax with a number of twists. The book can be purchased for £2.50 at https://www.amazon.co.uk/dp/B01N3ND8E0/ref=sr_1_1?ie=UTF8&qid=1479114904&sr=8-1&keywords=Making+A+DIfference+by+Michael+Beck. Michael Beck also wrote Harry’ Torment, which is also available on Amazon. Apart from the fact that Leila Albergo was born in England, she was just like any other seventeen-year-old U.S. high schooler. That was until, by a dark twist of fate, she develops supernatural powers. Leila also realises that some friends are not always who they seem to be and that staying alive at any cost, can sometimes be too high a price to pay. Leila, still in London and hell bent on claiming her revenge, goes in search of the two men who murdered her father. But aware of her presence and her abilities, they’ve gone to ground. Luca, still hopeful he can stop her from making the biggest mistake of her life, is determined not to let her out of his sight. Who will win this battle and will there be anything left of their relationship when it’s over? On returning to the U.S, Leila is approached by a blast from Luca’s past and offered a possible alliance with a group of witches. Tempted by their plan, Leila struggles to decide what to do for the best and turns to Nora for advice. Will Nora get what she’s wanted all along? Or will Leila fight the evil inside to restore her true soul. About the author: Jemma’s life has always been about travel. She spent her first ten years visiting many countries with her family due to her father’s job in the army. The family eventually settled in the North East of England, where she lived until a few years ago. At the age of twenty-one, she decided she wanted to go back to her roots and see more of the world and found the best way to do this was working for airlines. She has lived near Heathrow airport where she works as a flight attendant for a leading British airline, visiting amazing cities, countries and people; providing a wealth of knowledge and ideas for her books. But, Jemma has never missed the opportunity to go back home to visit her family including a niece and three nephews. She is now moving her base back to her home in Darlington so she can spend more time writing. Jemma has yearned to be a published author for many years and recently she has been able to put her dream into motion with the publication of her first book in the Crowded Souls Trilogy. She is an avid reader of a wide variety of genres, but chose to write in her personal favourites, young adult and supernatural, as she is still hoping for the day she develops her own super powers! The first three crime novels by writer Bud Craig, from the Darlington area, have been brought together and published as an e-trilogy. Salford Murders features three gripping private eye detective stories set in the industrial North. With the atmosphere of urban decline and inner-city violence, these three murder mysteries are set in the metropolitan area of Salford, Manchester – one of the most deprived areas in England. Darlington authors Paul Hodgson and Mike Jarvie have brought out their new e-book Give Them Wings. Disabled as a result of childhood meningitis, Paul has written this hard-hitting autobiography together with Mike in order to challenge the stereotype of the wheelchair-bound victim condemned to a life on the sidelines. Far from being a passive spectator, we learn about his life on the road as a fan of Darlington Football Club, a journey punctuated by a series of mishaps and drink-fuelled escapades, which are themselves invariably laced with laugh-out-loud black humour. The harrowing and thought-provoking account of how he struggled to care for his mother through several strokes and Alzheimer’s disease – and of the rift this caused within his own family – reveals yet another side to his nature. He also speaks candidly of his three-year love affair with a married woman, his experiences of education and employment, the Community Care system, the loyalty of his friends and his numerous fund-raising efforts. Give Them Wings – sometimes told using strong language – is a graphic story of one man’s fortitude in the face of severe odds, and it offers a unique insight into what it means to be disabled in modern society. For a native of Darlington, especially one born in the early sixties, this book will be an absorbing read. As the author says on page one, a “nostalgia-fest” though not an indulgent one. It’s a mixture of autobiography, social and local history, the author’s philosophy of life and his views on some of the social and political issues of the time. There are some gems “Looking ridiculous is the price to pay for serving God”, “The Plovers (neighbours) are Methodists but I don’t know whom they communicate with” and the author’s description of his feelings about Maths which must resonate with many readers. Some passages are moving:- the story of the swift, the memories of his grandmother and her death and the references throughout the book to his Mam and Dad – never sentimental but loving. For people not born in Darlington, or from a different era, Grainger Street’s appeal may be more limited, but it contains the elements of more than one good book: the social history, the autobiography, local history, philosophy and politics. Some editing, expansion of some parts, reduction or deleting of others could produce a book or books of wider appeal, as could a change from what is essentially a collection of essays to a continuous narrative. The writer’s style is relaxed, easy to read and entertaining. For a Darlingtonian, even one born sixteen years earlier I thoroughly enjoyed it. Who writes: “Despite initially having a touch of the “Adrian Mole Diaries” (Sue Townsend) about them, these are entries from my own edited diaries from 1982 – 1984: the time of the Falklands Conflict, Cruise Missiles at Greenham Common, the Cold War, the Miner’s Strike, Scargill, the Brighton Bomb, the IRA, the Ethiopian famine and the first hacking at the Welfare State. On 12th January 1982 I was admitted to hospital with bacterial meningitis after losing consciousness to an intense head pain. Two days later I woke up, groggy but in one piece and from that moment decided I’d write about the world through the eyes of a 18 year-old dumb, naïve, clumsy kid still living at home in a small town in Thatcher’s Britain intent on getting himself an education in the School of Life. The Inkerman Writers have launched their new book Picture This. Picture This is a collaboration between the Darlington-based Inkerman Writers and three illustrators, former Darlington College student Jennifer Batchelor, Darlington artist Heather Kinsella, a member of the writing group, and M Faulkner, a member of the East Durham Artist Network. Working on an idea by Inkerman Writer Ross Chisholm and his wife Pauline, members of the writing group selected fifteen of their stories and poems which they thought best lent themselves to illustration. The latest children’s books have been published by North East author Carol Dean, who lives in Darlington. Carol, who is married with two adult children, and three grandchildren, can trace the beginnings of her writing back to telling her children stories when they were little. She said: “Writing children’s stories all started as an entertainment for my son and daughter when they were children themselves. This usually happened on rainy weekends and school holidays, with my son writing stories about ghosts or vampires, and my daughter, who is the youngest, playing her part by drawing pictures to go with the stories. “I wrote the first of my ‘Granny Ridley’ stories for 7-9 year olds and “The Real Cinderella Story”. During this time, we added to the stories each time we wrote together to keep the suspense going for the next writing session. Before retiring, Carol spent most of her working life as a Fundraiser for various charities in the North East, before a career change when she worked for Durham Constabulary as the Special Constabulary Recruitment Officer and trained as a Special Constable. She is also a qualified Life Coach, Mentor, an NVQ Assessor. After taking early retirement due to a serious illness, she worked as an NVQ Tutor/Marker for a local college alongside working as an exam invigilator for students from 10 years old to degree level. You can find out more about her books on www.caroldeanbooks.com or follow her on Facebook. After the success of her 2016 bespoke Christmas book for Santa believers everywhere, Darlington based author Carol Dean has published her second personalised Christmas book “Santa and the Magic Dust”. Once Carol knows your child’s name and a cartoon image has been selected to represent your child, Carol will produce a book personalised for your child. The child’s name occurs 114 times in the book and they are an integral part of the story in which they work with Santa to try to save Christmas. But will they be in time…. The third crime novel by Darlington-based Bud Craig, Falling Foul, has been published as a e-book by The Book Folks. With his ex-wife appearing back on the scene and relations with his girlfriend Marti troubled, the murder of one of Gus Keane’s colleagues comes at a really bad time. Yet when his friend Jimmy is accused of the murder, he really must step up to the plate. With his knowledge of the local area, and a healthy suspicion that nothing anyone says is true, private investigator Keane must find the killer before Jimmy is convicted. Ex-rugby player-turned social worker Gus Keane supplements his retirement fund with detective work and the crime-hit deprived areas of outer Manchester provide a fair amount of case work. Bud Craig is a member of Darlington-based Inkerman Writers. His previous novels are Tackling Death and Dead Certainty. Twenty writers from the North of England, including Pam Plumb from Darlington, have been announced as winners of the Northern Crime Competition. Leeds-based writer Kathleen McKay has won £1000 and the publication of her contemporary crime novel, Hard Wired, by Moth Publishing in summer 2016. A further 19 northern writers have won the Northern Crime Short Story Competition, including Pam, a member of Darlington-based Inkerman Writers. Their prize-winning short stories are published in an anthology, Northern Crime One. From rural noir to urban horror, Northern Crime One promises to bring a chill to your winter nights. The wide-ranging collection showcases some of the best emerging talent in UK crime, proving that short stories are the perfect form to introduce fresh blood to the crime-writing scene. The Northern Crime Competition, run by the crime imprint Moth Publishing, was founded to recognise and to publish talented new crime writers from the North of England. Moth Publishing is the crime imprint of Mayfly Books, a partnership between New Writing North and Business Education Publishers Ltd, a trade publisher. Pam was inspired to write Memento Mori, her short story in this anthology, after attending the 2014 Crime Story weekend held at Northumbria University. Some of her other work, in the form of short stories and flash fiction, has been published both traditionally in anthologies and on a variety of websites and online magazines. Recently, Pam won the Cockermouth Crime Short Story competition which was judged by crime writer Mark Billingham. The latest thriller by North East England author Roger Barnes has been published. Snow Birds, published as an ebook through Inscribe Media, is the third novel by the Darlington taxi driver following on from White Gold and Lost Souls. After a number of high profile drug related deaths from pure cocaine supplied through London clubs to their patrons from the Financial Sector, Political Elite and ‘A’ list Celebrities the authorities realise something out of the ordinary is happening and must take action. A team set up to investigate and deal with the threat immediately realise it relates to a planned terrorist attack using biological weapons. The situation becomes increasingly more complex when it’s later found that similar attacks are also planned for New York and Berlin. The team, comprising Special Forces personnel, a retired Police Officer along with representatives of the British, American and German Security Services, establish the drugs’ route from Bolivia to the targeted cities. Subsequently they discovered where the biological weapons are being produced and put in place an operation to eliminate all those involved. With the deadline for distribution fast approaching it becomes a deadly race against time to stop the attack and the disastrous consequences. The final resolution is hampered by the indecisive action of Politicians, who while they themselves are being targeted are more concerned about their own image then the welfare of the citizens that elected them. The new book by Darlington-based Pam Plumb, ‘Akos Novus’, is now available from Amazon (at http://www.amazon.co.uk/Akos-Novus-Pam-Plumb-ebook-x/dp/B013HBXQYA/ref=sr_1_1?ie=UTF8&qid=1439987695&sr=8-1&keywords=akos+novus). It’s 99p and is an e-book only. It’s a young adult conspiracy thriller set in modern day London with flashbacks to medieval Baghdad. 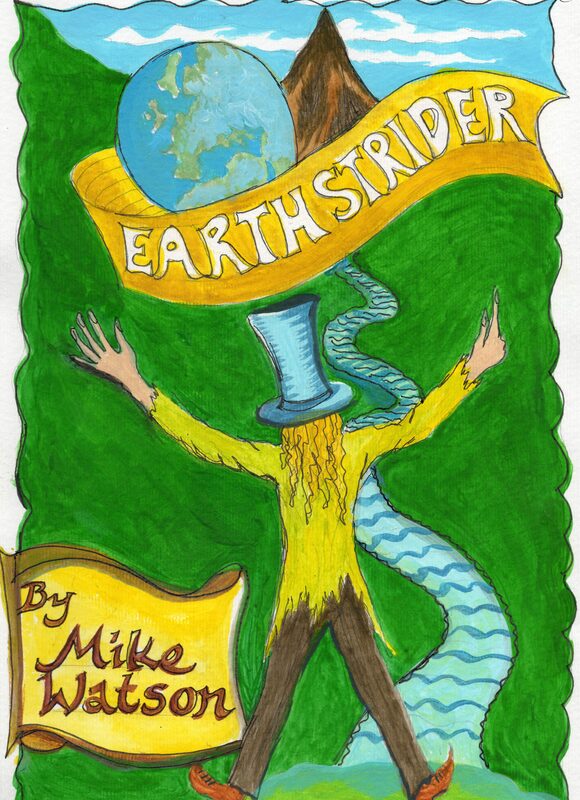 Earthstrider by Mike Watson – is a lyrical story for children about a magical stranger who makes a river flow again. In 1919, two Irish boys are caught in a cross-fire between the IRA and the British… one boy is protected by a soldier, while his friend is used as a human shield. As men, both will be forced to leave their homeland behind and ‘cross the water’. How will they survive cruelty, trauma, and the pain of emigration? Will they find the courage to follow their dreams despite one setback after another? Both will become fugitives from justice, and both will cross the globe as they struggle to survive and hang on to their self-respect – especially when world war two erupts and rages around them. And both will find sanctuary with a troubled family in a remote corner of northern England, where their story blends with a Dales version of ‘When the boat comes in’… how does an ordinary working man raise six daughters while taking care of his increasingly crazy wife? And how does a young woman choose between her close-knit family and the man she truly loves? Social worker turned Private Eye Gus Keane returns in this gripping murder mystery. If something happens in Salford, Manchester, it is generally bad news and when two dead bodies turn up within a few hours of one another, it is no exception. With the local force stretched to the limits and firing blanks ex-rugby player Gus Keane is asked to step in to help find the culprits. What follows is an ever thickening plot as Keane gradually begins to unravel a mystery from Salford’s shady past. DEAD CERTAINTY is an exciting suspense thriller that all the family can enjoy. Be sure to check out TACKLING DEATH also by Bud Craig. Published by The Book Folks, an imprint of Not so Noble books. This is an e-book available to download now via Amazon. An international group of flash fiction writers, collectively known as Flashdogs and including writers from our area, Inkerman Writer Pam Plumb among them, have launched their first anthology. The anthology comprises one hundred and ten stories from thirty -four writers covering styles and genres from dark comedy to sci-fi to poetry. Stephen Baird, of Darlington, has recently setup a Kindle-based quarterly magazine publishing science fiction, fantasy and horror short stories and is looking for more submissions. Wicked Words publishes science fiction, fantasy and horror themes and we are looking for previously unpublished, high-quality stories that surprise the reader and play with the genres. So if you have stories that fit these criteria why not submit them to be considered? If you like reading short stories in this genre why not sign up to the newsletter where you will be kept up to date on how the project is progressing? Wicked Words is published at the start of June and then quarterly after that September, December and March. They are looking at running a special at Halloween so look out for a post with more details soon. Author Bud Craig, a member of Darlington-based Inkerman Writers, has had his first book published by No So Noble Books. Tackling Death, available as an ebook, is about Salford-based ex-rugby league player turned social worker Gus Keane, who is closing up his case files in preparation for retirement, but a bruising encounter with a client sets off a chain of events in which he finds his boss murdered. Now turning private eye to uncover the truth, as more murders occur Keane himself comes under suspicion in a thickening plot involving blackmail and a missing girl. When he closes in on the killer will Keane come out on top or fall victim to the murderer’s desperate moves? A new book aimed at encouraging children to brush their teeth stars a real-life North-East dentist. Andrew Wilson, of the Cleveland Terrace dental practice in Darlington, features in the second children’s book written by The Northern Echo’s editor Peter Barron. Black-toothed Ruth Black is the latest book in the Monstrous Morals series, which aims to help parents sort out their children’s bad habits. The first book in the series, Fartin’ Martin Sidebottom, is about a little boy who couldn’t stop breaking wind and joined a brass band conducted by the Devil. Black-toothed Ruth Black is a little girl who refuses to brush her teeth and gets kidnapped by the evil tooth devils. The story also involves Mr Wilson falling into a giant cavity in one of Ruth’s teeth. “I think the book is fantastic and I’m honoured to be the featured dentist. Anything which encourages children to brush their teeth is fine by me, “ said Mr Wilson. The book is illustrated by artist Paul Wick and published by Carpet Bombing Culture. The author and illustrator will be signing copies of the book at Waterstone’s in the Cornmill Centre, Darlington, between noon and 3pm on Saturday (November 9). The book is also on sale at Guru in Darlington, The Northern Echo’ head office in Darlington and on the internet through Amazon. The third, fourth and fifth books in the series – Fidgety Bridget Wrigglesworth, Nose-Picking Nicholas Pickering, and Messy Bessy Clutterbuck – are scheduled to be published next year. Alan Hall, a member of Bennet House Writers, has produced a book called A Poem For Jesus and it tells the Gospel Story in verse. Alan’s idea was to help people, especially perhaps young people, who might not consider reading the Bible to get an over-view in a readily readable form. The book has recently been reviewed by Harry Mead in the Northern Echo. Proceeds from the sales go towards group funds. The group meet at the above address every Monday morning at 1030 and will be pleased to see any new faces. Further details can be obtained from Mary Sweeten 01325 283401. The Inkerman Writers’ latest book, Out of the Shadows, was launched as part of the Darlington Arts Festival 2013. The Inkerman Writers, for whom 2013 marked the tenth anniversary, attend creative writing evening classes at the Friends’ Meeting House in Skinnergate, Darlington. The groups were asked to imagine walking through a darkened house. Eventually, they came upon a room in which they found a single shaft of light. They were asked to say who stepped into the light. The result was the anthology. Inscribe Media of Darlington has published seven book titles. All can be obtained by keying their titles into the search field of the Kindle shop at www.amazon.co.uk. Two authors from the North East of England have gone into print with ebooks, the sixth and seventh published through the Inscribe Media imprint. The thriller Lost Souls is Roger Barnes’ second ebook, following White Gold, and crime novel Harry’s Torment is Michael Beck’s first. Both authors are from Darlington. When young women start to go missing in Africa, the kidnappers warn not to investigate but the police do and the women’s hideously mutilated bodies are returned. After that the investigations are stopped and a continuing flow of traumatised victims are returned alive, having being used in the most brutal and degrading ways. This continues until another four are abducted and the British Government decides it must act and recommence the investigation, but this time using a very different approach. A Special Forces Major with an uncanny knack for finding people is teamed with an unorthodox politically incorrect police officer, and both are asked to volunteer to try and find them. It becomes apparent that not only British women are being abducted, so a small International Strike Force is assembled to rescue them and ensure it is stopped, permanently. Harry’s Torment is set in the fictional east coast port of Thirlston and is centred on the heroin trade. Unlike some other crime novels this is not a ‘who done it’ as we very soon discover identity of the local drugs baron. We see how the officers try to piece together various bits of information in their pursuit of him and how he attempts to stay one step ahead of them. This takes place alongside a personal feud between two senior customs officials and this impacts upon one of the officers in particular as he is used as a pawn in their struggle. His close working relationships with a local detective inspector also causes problems and pressures for both parties as the story comes to a dramatic conclusion. Michael spent 38 years with Customs and Excise and took early retirement in 2005. In that time he worked in most of the disciplines within the department and was responsible for all the anti-smuggling teams in the north east of England between 1990 and 2000. He is a member of Inkerman Writers and Bennet House Writers, both Darlington based writing groups, and has written a number of short stories. Haghir the Dragon Finder by John Dean , a comic fantasy for older children. Haghir and his hopeless comrades are dragon slayers seeking a new challenge. John is from Darlington. £1.48. Vegemite Whiskers, a selection of some of the finest writing from Australian authors who have entered the Global Short Story Competition. Price £1.48. Cyber Rules by Myra King. The novel by Australian writer Myra tells the story of a farmer’s wife in isolated rural Australia. Caught up on the addictive side of the Internet, she holds a secret which may prove to be deadly. Price £2.05. In January 1996, Phil McKenzie leads his Special Air Service team, on a secret mission into Kentobi, Africa. An assassin codenamed Chameleon, kills the Kentobi president, but Phil is framed for the murder. He negotiates liberty at a high price; an end to his military career. Following a brief secondment to the Metropolitan Police and discharge from the Army, Phil returns to his hometown as Hawk, a vigilante. The term, ‘deniable ops’, finds new meaning as Phil tackles Glasgow’s underworld with his small, unique team. Using stealth, intelligence, and bloody violence, Phil hunts down the city’s Godfather. Glasgow-born Tom Benson, now in Darlington, joined the British Army at 17, serving from 1969-1992. He next took up Retail Management which he continued from 1993- 2012. Tom started writing in 2007 and has had four short stories published in anthologies. November 2012 saw the self-publication of his debut novel ‘Ten Days’ as an eBook with Smashwords. During March 2013 he revamped some details and altered the cover and title. It is now, ‘Ten Days in Panama’ and published on Amazon. Tom is currently serialising his 730 poems as genre-based eBooks and working on his next novel. An excerpt from ‘Hawk – A Manhunter’ is now included at the end of ’10 Days in Panama’. Welcome to the 2013 Revised and Reedited Edition of the author’s best selling book Hidden Secrets Buried Treasure. This book is packed full of challenging ideas, alternate concepts and simple exercises and clear concise examples designed to inspire thought, ignite change and improve your well being. A straight forward guide to creating a fulfilling life in a modern world. Kate Gregory can hear people’s thoughts and it is something she has learnt to hide. One day she hears something that may threaten the life of a child. Now she has a dilemma. To save the child does she tell people of her ability, if she does will people believe her, and if she’s wrong, what damage will she do? When Toni Harris loses her family in a freak accident unexplained things start to happen in her isolated farmhouse that leave her fearing for her sanity. Then a chance meeting results in Toni, a rational business woman, agreeing to a spiritual quest in the hope of overcoming her grief, banishing the demons of her childhood and carving our a new life for herself. What she doesn’t bargain for, is a series of events which lead to a struggle to the death. The Cross Over is a spiritual adventure that explores the concepts of life, death, life after death and who we really are. Until a woman moves in next door who stirs up murky secrets from her past, and forces Jackie to look at the one thing that she can’t run away from, her self. Treading Water is a powerful story of the struggle we all have, to be who we were born to be. Writer of modern gritty spiritual thrillers for the thinking mind designed to challenge, inspire and entertain.